This is a little church about 9 miles outside Hartford City that is on the main state road. It is always immaculate and I have taken photos of it before but never with the graveyard included so when Lisa and I went on our safari the other day I made a point of stopping and getting a few reasonable pictures. I think it is very quaint. We had our new Photo Club meeting last night and it has been great to get toknow a bnch of people in the community who also enjoy taking photos and want to get better and understand more. Most of them have compact digital camera but we are covering copyright, composition, lighting, inside flash and that sort of stuff. The group is made up of mainly women who are in my age group or a bit younger and older except for one of our members who is a 12 year old girl that has an exceptional eye for a great picture. Liz, I was born in Bulawayo Zimbabwe and when I moved to SA I lived in Benoni and Sandton, both suburbs of Johannesburg. We used to go to East London (a coastal town on the east coast of SA) every second year from when I was a small child travelling there by train from Zimbabwe. It was always such an adventure. 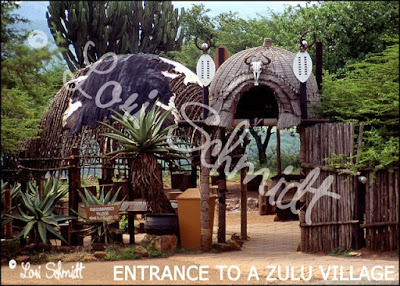 I have had brief visits to Durban, Port Elizabeth and Pretoria but most of my time was spent in Johannesburg. 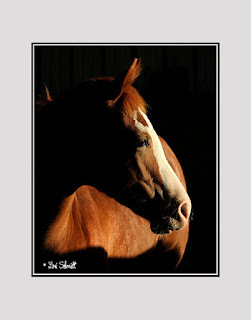 Kym, I belong to a group of photographers and artists "The Equine Arts Protection League" and we all look out for each other's work. The main abuse has been the Chinese paintings brought in and sold dirt cheap, I think Walmart sells these a lot and am willing to bet that some of them have not been released to copy and sell. The other place for lots of abuse is e-Bay. We find a multitude of products that people make using our photos, it is a pain to police and an ongoing project. If we can prove infringement eBay will shut the seller down immediately. People seem to think that just because a picture is on the internet it is theirs to do what they like with despite the copyright notices on them. This is so far from the truth. Every single photograph you see is owned by the person who pushed the shutter, unless they give the rights away, even your family shots of the yearly barbeque. It does not have to display a copyright symbol because it is automatically protected. It makes it very hard for those of us who are making a living from our photography to compete against people who just give their work away for the thrill of seeing it and their name in print and most of the publications and magazines see it as a way to get free photos by preying on the unsuspecting social photographer. Always remember you paid a lot of money for your equipment, it should pay for itself. This is a very long and complicated subject but I will leave it there, just think twice next time you are tempted to save a photo you like on the internet and make it your screensaver or print it to frame it in your home or make a piece of jewellery, that is illegal. Even if you are only copying it as a painting or drawing it is still illegal it is not yours to copy. A lot of artists think that because they make their own artwork from a photo they have lifted off the web it is okay and then the artwork they make becomes theirs, this is not true. You have to get the permission of the photographer to copy or use their work for any reason. Donna I hope things look up, I am hoping that they will become collectors items like trading cards. It is an inexpensive way of enjoying photographs made by others legally without spending a fortune and can be built up as a collection. Abraham, unfortunately having to watermark your images spoils them for the viewer but it has become necessary. I still have to work it into my workflow, as you see today's pic isnt watermarket!!!! but it does have my copyright statement on it. Okay that is my speach for the day LOL. Please visit my Etsy shop if you havent already, the link is in my last blog entry. Miserable rainy cold and overcast here so I am staying close to home but have to go to town quickly. I have been going through a lot of my old photos, the few that I did get scanned and on CD before I came over here and subsequently lost my original photos, slides and possessions. The majority of the digital photos and scans are not of very good quality because 10 years ago things weren't as advanced as they are now with digital and good film and slide scanners etc. but they will make great small prints. 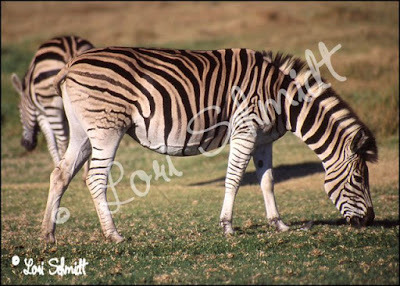 I have started watermarking my photos as theft on the web has become a problem, and we find our photos and artwork are being stolen and used in all sorts of applications to manufacture jewellery, light switch covers, keychains, greeting cards and 1000 other things that only require a small resolution image. The ones above were taken in South Africa. I am making up a series of ACEO cards, the type that artists hand paint measuring 3.5" x 2.5" and they have people who collect them. If you can't afford a whole bunch of original large prints or paintings and you like a particular artist or photographer's work, this is a nice way to be able to appreciate and possess someone's art or photography for a reasonable price. I have been listing them on http://www.etsy.com/ my username is Loriprophoto so if you do a search you can find my shop or you could click on this link Lori's Etsy Shop and you can check out some of my photographs and crochet skills (my relaxation) and heck who knows for a small sum you could own a collection of my photographs and boast about having known me when I was a poor starving artist after I become rich and famous!!! Yeah right. This site is dedicated to hand made items and antiques and you can find just about anything hand made on there. It has a lot of jewellery. I started crocheting a few months ago when I was really stressed out and have made all sorts of product, dish wash cloths crocheted in wool (believe me they really work well), baby blankets, scarves, beanies, tissue box covers, toilet roll holders and many other things. Now I am sitting with a box of goodies and nowhere for them to go LOL. After our beautiful spring weather we have plunged into freezing temps this morning with rain sleet wind and snow all day. They say it will warm up later, we will see. That's it for today guys and gals, hope you are all surviving this inclement and variable weather (((((Hugs)))))) to you all. Lisa and I went to get grain for the horses yesterday and decided to do a safari at the same time as the place is about 40 miles away. Remind me to never get the two of us together again to go driving where we dont know where we are going because we are both hopeless navigators. We thought we were heading east along the backroads and ended up heading west and backtracking 10 miles in the opposite direction from where we thought we were going!!!! 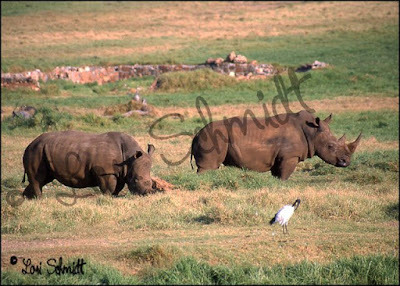 Anyway we did find our bearings and headed on to get the grain and then did a bit of safari again afterwards even with my overloaded truck (hubby had ordered nearly 1 tonne of grain and my truck is only big enough to hold half a tonne (1000 lbs, we had 1650 lbs). It was a bit of a dreary day but we got a few shots which made it worthwhile, we also saw a lot of spots we would like to go back to when the light and conditions are better. 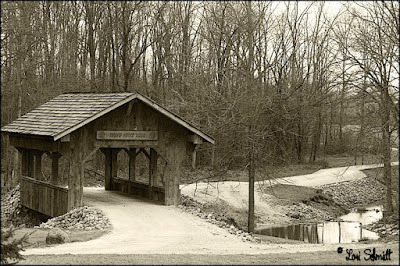 The covered bridge above is one of the "treasures" that we came across on our travels!!! I will definiely go back there when the trees are green and the light is better. I have been working on my stock photos and also my Etsy shop, so if you want to own a Lori original in miniature or in a larger size head over there and have a look, they are very reasonably priced, and who knows maybe I will be famous one day and you will be able to say you have a collection of ACEO/Trading cardS (3.5" X 2.5") by me LOL. I also have a bit of my crocheted goodies there. Here is the link to my store http://www.etsy.com/shop.php?user_id=6874447 it is a very interesting site to visit as all of the items on the site are either hand made or vintage. I am also going to be listing some of Valerie's artwork on my store so be sure to check it out and check back every so often for updates. I have so many pictures it is hard to focus on where to start! Hope everyone is well ((((((Hugs)))))) to you all. Sunday 22 March 2009 - Popping up again!! If there is still anyone out there LOL I am still around, so much happening and not enough hours in the day. This past Friday evening one of our local ladies, who has started a small photographic group in our town which meets once a month, arranged for us to listen to Kevin Ford, the Astronaut for the August 2009 mission who has been given the task of taking all the photos on their trip to and from the International Space Station. Please note these pictures are protected by copyright and although I have cleared posting them here on my blog they are not to be copied or reproduced in any way. NASA is very specific about what photos are seen and where they are seen for obvious reasons. Unfortunately we had bright sunlight coming in the windows from the left side of the frame which made shooting quite hard with or without flash and made the pictures on the screen murky even for those of us watching the presentation. I wanted to show you two although I have a few more which as I edit I will share. These were shot available light, hence a bit of a color cast and they are a bit grainy. 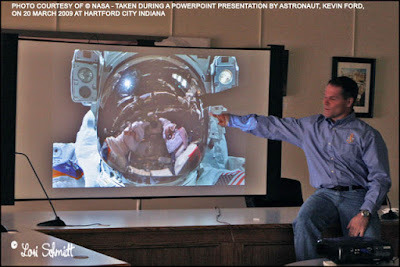 The first photo is of Kevin explaining to us the trials and tribulations, difficulties, etc., of shooting in these confined and extreme conditions and this is a self portrait taken by one of the astronauts on a previous mission. If you click on the picture you can see a slightly larger version and you can see the camera reflected in his visor. 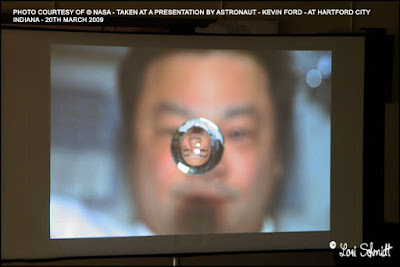 The second picture is of a water droplet in negative gravity floating in the atmosphere and the photographer took a photo of it with an astronaut behind it so that the water droplet inverted him so that he was upside down. This is quite a cool thing to do with a glass of water or such, anything viewed through the water behind it will be upside down. We are hoping that after the mission he will come back and show us some of his shots, he has been training for about 5 years for this mission, lots of planning and patience and he gave us a really interesting talk both from an aerospace and photographic point of view. I will be sure to watch this launch. Wish I could convert them to Canon thought LOL as all his equipment is Nikon and I am a Canonite! We have battled every year to find hay and afford the cost for the last 8 years (I did a count of what we spent on hay this year and was horrified), so Larry decided we needed to do our own baling. It was just a matter of finding the right equipment for the right price, the right price being the optimum because we had to borrow to pay for it so it has to pay for itself quickly. Stan found some equipment about 40 miles away and it was a really good deal, farm equipment is horrendously expensive despite the fact that it is all really old, but because it is only used a few times a year, if it has been cared for properly it will be reliable. Yesterday we spent the WHOLE afternoon towing some of it back from where we bought it, I had the hay rake behind my vehicle and couldnt do more than 10 - 15 miles an hour without it getting into a speed wobble, so you do the math, on top of it we had to take all the backroads because we just couldnt be on main roads doing these slow speeds. We got home at 7pm! Never again, Larry was with me and was a nervous wreck, which made me one too by the time we got home LOL. 10 March 2009 - Out of Hiding again but for how long???? 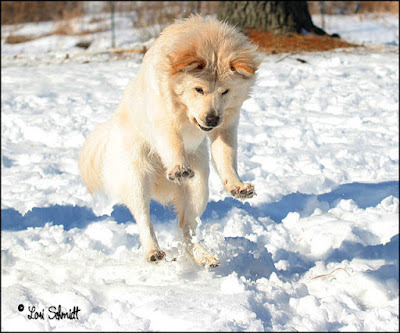 Today's picture is another of Stan and Valeries 8 month old puppy, Shami, she loves water and loves snow even more, here she is pouncing on a snowball one day while they were here fixing our well which had packed in again. I don't know if it is from the kick I received to the head two months back has changed my demeanor or personality (the cartlidge in my lower earlobe where it was torn is still very painful believe it or not even after all this time) because since then I have really been struggling to feel positive about anything. At least I have got down to saying hi to all of you guys at long last LOL. I have been doing a lot of crochet in the past few weeks, something I learned to do as a teenager. I have made stacks of baby blankets and all sorts of stuff over the years and for some reason just got obsessed with it after my accident. I put some of my stuff up on a site called Etsy.com which features home crafts and hand made items for sale, it is very cheap to put up an entry, 20c for 4 months. You can see some of my stuff at this link, http://www.etsy.com/shop.php?user_id=6874447 , I think you may have to register to see it but it is free and quick and quite an interesting site to browse around. I have had a lot of hits but no takers this far and need to add a lot more that I have finished because I have boxes of finished goodies!!! !